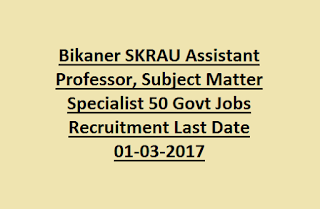 SKRAU, Bikaner Assistant Professor Examination 2017: Swami Keshwanand Rajasthan Agricultural University SKRAU, Rajasthan has given notification to recruit candidates for Asst Professor, Associate Professor, Subject Matter Specialist, Programme Coordinator Jobs. There are total 50 vacancies available in this SKRAU Rajasthan recruitment. Candidates having eligibility criteria may download the application from the University website @ www.raubikaner.org. Closing date to receive Offline applications is 01- March- 2017. Selection of the current vacancies in SKRAU will be based on merit in written test and Interview. Available Vacancies, Age limit, Qualifications, application procedure, Pay scale and other details of Swami Keshwanand Rajasthan Agricultural University SKRAU recruitment exam 2017 are given below. Click here to see the official notification of Rajasthan SKRAU Programme Coordinator, Associate Professor Recruitment. Last date to send application form: 01- 03- 2017. 2. Associate Professor: 10 posts. 3. Assistant Professor: 13 posts. 4. Programme Coordinator: 07 posts. 5. Subject Matter Specialist: 18 posts. Subject wise and Category wise vacancy details are given in SKRAU official advertisement. Pay scale for Asst professor, Subject Matter Specialist posts is Rs.15,600 to Rs. 39,100 plus GP Rs. 5400 to Rs. 6000/-. For other posts is Rs.37,400 to Rs. 67,000/- Plus GP Rs. 9000 to Rs. 10,000/-. Cleared NET (National Eligibility Test) or similar test conducted by UGC/ ASRB/ CSIR in the relevant subject. Desirable: Ph. D Degree in relevant subject. Subject Matter Specialist: Must have qualified Master’s Degree in relevant subject with minimum 55% marks (SC, ST- 50 %) from an Indian recognize university or its equivalent degree from an accredited Foreign University. For other posts qualification details see the SKRAU, Bikaner notification. Maximum Age limit of the candidate for Programme Coordinator post is 45 years. For Subject matter Specialist is 35 years as on last date of receipt of application i.e. 01- March- 2017. Upper age relaxation for SC/ ST candidates is according to orders issued by the Indian Govt. 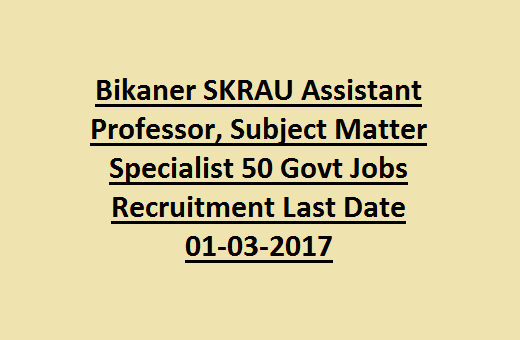 Selection for this SKRAU Bikaner recruitment will be based on candidate performance in written examination, and Interview. Application fee for general candidates is Rs. 1000/-. For SC/ ST candidates is Rs. 500/-. Eligible candidates having desirable qualifications may go through the S.K. Rajasthan Agricultural University, Bikaner official website @ www.raubikaner.org to download the application. Fill the application form with all the details, send to the Office of the Registrar through post. Closing date to submit offline application is 01- March- 2017 along with Fee Demand Draft.